The new foldable handset patent by Oppo reveals a device that seems to use a hinge to allow its user to bend the entire top part at an angle. Obviously, this might never turn into a market-ready product. Although true foldable handsets might still be a few years away, we keep hearing about new such devices quite often these days. In most cases, this is just about patents or early prototypes, but the ZTE Axon M is already available for purchase, and a first such handset by Samsung is expected to arrive in the coming months. Now, a patent by Chinese brand Oppo surfaces online showing another foldable handset. Oppo's patent shows a handset that does not have a flexible display, using what appears to be a hinge that allows the upper part of the device to be bent at an angle. When not used, the upper part of the display is placed on the back of the fixed part of the device. The entire mechanism looks much more complex than the hinges used by convertible tablets these days and, by the looks of it, is not one of those straightforward hinges that can last for ages. In the end, such a device might be handy due to the fact that the extended display should not be necessary each time the user needs to operate it. 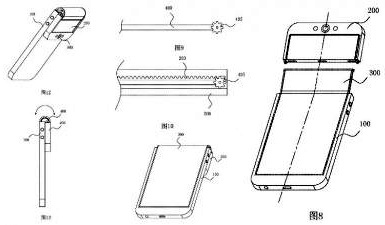 Unfortunately, by the looks of the handset shown in the patent, the speaker is placed on the foldable upper side, so each time the user has to answer a call, the device should be unfolded. If this phone turns into a retail product as it is, I guess it will not become popular anytime soon. While 2017 seems to be the year of the bezel-less phones, 2018 might be the one to see the introduction of more foldable handsets. Remains to see if this new design approach goes mainstream or not.